Posted by utechalumni in Job Search Tips, JOB VACANCIES. In my other professional hat as a Life & Career Coach, on February 4th, 2019, I shared the post below on LinkedIn and my other social media sites, to help professionals think clearly about their current financial position. In addition, I wanted to help them think clearly about their options to improve their financial health. The post has been well received and so I thought that it may be of help to you as well. Please see below. DID YOU KNOW that JAD $1M = $50,000 net a month approx? Posted by utechalumni in Alumni Relations Office, Business Development, Job Search Tips, JOB VACANCIES, Personal Development, Professional Development, UTech Events, UTechJa Fundraising. In keeping with our commitment to sharing content that will support your Personal, Professional, Academic and Business Development Goals, we share 10 simple reasons why we believe you should be ACTIVE on LinkedIn. Your actions and engagement on LinkedIn have a potential reach of 400 + million users, located in 200+ countries, with 70 % of the users living outside of the USA. This is good for persons with international interests. Based on current business and lifestyle trends, and the influence of the internet on daily life, increasingly, if you do not have a professional online presence, through which interested parties e.g. Prospective Employers, Scholarship Donors, Venture Capitalists, Prospective Business Partners can research you, this will be seen as a ‘red flag.‘ Not having a well crafted, professional, online presence will make you un-competitive as a professional and entrepreneur who needs a thriving network in order to accomplish significant goals. With the growing dominance of LinkedIn in the professional, business and academic space, it is the first online context that anyone wishing to research you will visit. Have we convinced you that if you are a career conscious professional or serious entrepreneur that you need to be ACTIVE on LinkedIn? Add Us in the Alumni Relations Office to Your LinkedIn Network Here! Join Your LinkedIn Alumni Group Here! Want to maximize the opportunities LinkedIn presents you to achieve your personal, professional, academic and business goals, but confused about how LinkedIn truly works? The Alumni Relations Office Will Help You! As you know we in the Alumni Relations Office at UTech, Jamaica offer a variety of Professional Development Services. Among our services to you is the LinkedIn Profile Review and LinkedIn Networking Strategy Consultation. From these services you will learn how to optimize your LinkedIn Profile as well as what strategies to use to accomplish your networking goals on LinkedIn. For each of our Professional Development services we request a donation of JAD$3000 to our University. Alumns who wish to purchase 3 or more services receive significant discounts. Part-proceeds will be given to the Student Welfare Fund. Learn more about our Professional Development Services and your opportunity to donate to strengthen UTech, Jamaica’s capacity to serve you as Alumni and our students, by selecting the 2 links below. In addition, feel free to call us at 876-970-5468 or 876-809-4274 or email us at cmessam@utech.edu.jm, if you have additional questions about our Professional Development Services. *****Even if you are an Alumni currently based outside of Jamaica, and you wish to benefit from our services, we want to support your goals too. So contact us today. Posted by utechalumni in Alumni Relations Office, Business Development, Job Search Tips, Professional Development. UTech Alumni, Can we help each other? SO CLICK HERE FOR YOUR EXCLUSIVE PROFESSIONAL DEVELOPMENT OFFER! Posted by utechalumni in Job Search Tips, Professional Development. Recruiters truly want to know via resume and interview, the answer to the question “What value will this candidate add to my organization?” This cannot be answered clearly by reviewing a list of tasks that a person did in their current or past work or volunteer assignments. When we work or study or volunteer, we are to create…impact. It is the impact (how things changed for the better as a result of our effort) that makes our contribution to an organization or event worthwhile…and measurable. It is an unfortunate truth, that many of us take jobs and go to work daily with a “task completion” mindset. This is a focus on the job description and duties. We do not know, research or analyze how our particular role contributes value to the overall goals of the organization to which we are employed. That is a “value-adding” mindset. Years pass, and when we need to apply for another job or a scholarship, we are unable to quantify or illustrate clearly the difference our work has made on behalf of the organizations for which we have worked or volunteered. Take action today. Figure out how and why your role in your organization matters. If you are in a dead-end job [many jobs are just that] and you have been given tasks that do not allow you to quantify the value you add, then seriously consider relocating to a more productive role in your organization or looking for a new job as soon as possible. This is the only way that you will be able to compete as a professional as the ‘nature of work’ changes and jobs get more specialized in skill requirements and continue to be scarce. What steps have you taken within the last 6 -12 months to acquire or improve skills required of the 21st Century Professional? Do you know the job outlook for your particular profession in the country, city, state, in which you reside? Based on industry trends and news, is your current job, skill set, company viable? Do you know how to strategically use the internet and social media to passively and actively job hunt and grow a viable network of like-minded professionals? Do you know why it is vital based on career trends for professionals to have an online and social media presence? What are the scarce skills in your industry or related industries that would make you more competitive in a job hunt? When was the last time you created an inventory of all your skills? What is your survival plan in relation to job loss? The day-to-day management and outcome of your career over your lifetime is the responsibility of the Professional…never the employer. Take action today. Posted by utechalumni in Job Search Tips. We hope that this website will give our CAST-UTech Graduates a general sense of what employers are offering as salary these days. UTech encourages you to do additional research as part of your standard third-party verification process. You may ask HR Managers in your network, colleagues and other professionals working in jobs/professions you aspire to, and also check with the following agencies i.e. Jamaica Employer’s Federation ; the Ministry of Labour and Social Security; and the Statistical Institute of Jamaica and the Human Resource Management Association of Jamaica. What Do Jamaican Salaries Look Like? The website allows you to view salaries by month and by year. We speak to Grads and students often and are increasingly concerned that you may not be fully prepared to grasp the opportunities that are available every day, and which may transform your life and career positively and dramatically. Please, please, please, we strongly encourage you to pay keen attention to the following as a way of living prepared to benefit from opportunities that may come your way. – Take personal responsibility to DO RESEARCH on every matter that touches and concerns your life, without expecting that someone will lay out the information for you. – Seek out a Mentor or several older persons with whom you can have mentoring type conversations and receive…ongoing guidance about your life and work goals. Older persons have a wealth of information which can help you make the right decisions…faster. In addition, they can be your connectors to a variety of influential persons and relevant opportunities. – Work to build your self-confidence, your courage, and overcome shy-ness or feelings of unworthiness. – Get help if you need it to become bold, and fearless and comfortable in asking for and going after the good things you want for your life. – Ask for help whenever you need it. There are still enough caring people left in the world. Search high and low for such people, if you need to. The quicker you get help, the quicker you can resume your path to progress and creating the life you want. – Follow-up! Follow-up! Follow-up! Follow-up right away. – Let your word mean something. If you agree to do something–get it done and on time. We hope this will be helpful to you, and that you will live p-r-e-p-a-r-e-d lives. Posted by utechalumni in Job Search Tips, JOB VACANCIES, Uncategorized. I am inspired to write this post out of my grave concern for job hunters in today’s reality of a poor local and global economy. My graver concern stems from the fact that many persons I speak with who indicate that they are searching for a job, exhibit behaviour which leaves me wondering if that is in fact the case. The main element which I believe is missing is a good and realistic attitude to finding a job and facilitating successful career management. Too often I am observing alleged job seekers who have unrealistic expectations, poor knowledge of the labour market and their industries, poor knowledge of the requirements of the jobs they seek, slow or lack of follow up on suggestions or opportunities, nonchalance, “Oh, I will get to it later” and “I didn’t take action because I don’t know where…how…who” mindsets.” Bear in mind, that attitude has a direct influence on action or behaviour. Attitude has a direct influence on action or behaviour. If any of these descriptions are true of you, I have to conclude—You don’t want a job. If you do get a job, it is very likely that you won’t keep it because of your poor and inappropriate attitude. In a poor local and global economy and a seriously contracted labour market, with high unemployment levels, especially among the youth population, your attitude towards: taking total responsibility for your life and job search, researching relevant information, connecting with knowledgeable people and cultivating good relationships with persons of goodwill and taking consistent action, will play a major role in determining your competitiveness in the labour market. Any experienced HR Manager or hiring manager will tell you that they prefer to hire someone who is not technically ideal but has a good attitude, rather than someone who has most of the technical skills and experience required for the job, but has a poor attitude. If you are serious about finding a job, begin by eliminating any gaps you have in the quality of your attitude. That good change you want is coming, and you want to be prepared to get it and to keep it! UTech Alumni, you are invited to participate in Job Fair 2015. 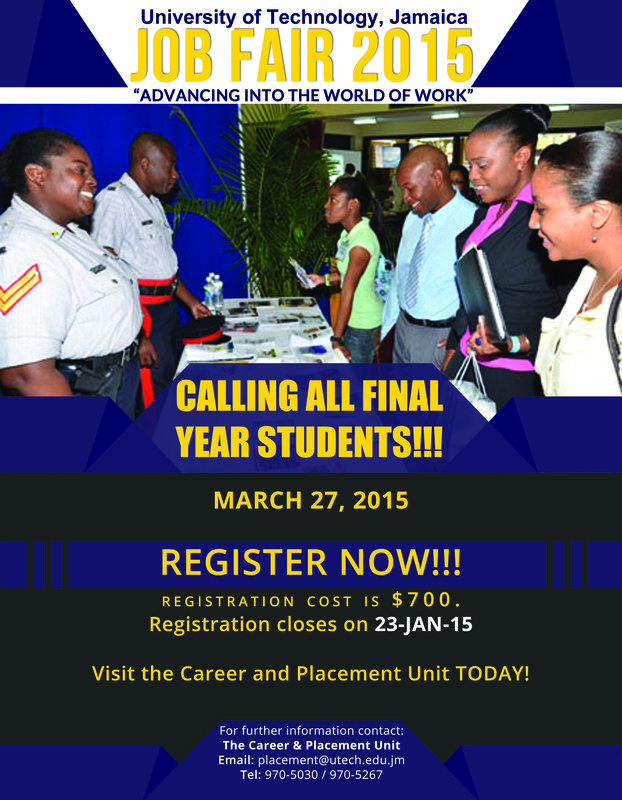 Please contact our Career & Placement Unit for details the registration deadline is February 20th, 2015. Posted by utechalumni in JOB CLUB, Job Search Tips, JOB VACANCIES, Uncategorized. Posted by utechalumni in Alumni Relations Office, JOB CLUB, Job Search Tips. Clarity on your skill set that you have to offer the labour market – Will enable you to increase the variety of jobs you apply for. Clarity on the local &/or overseas labour market trends based on your analysis of job advertisements and financial news relevant to your job or industry of choice – Will help you verify the demand for your targeted job position; and verify if it is time to change fields, pursue higher education, change your job search strategy, or pursue an entrepreneurial venture. Clarity on how to use social media in your job search strategy – Will help you increase your job search strategies in a contemporary way – The more relevant strategies you incorporate inclusive of using information & communication technology, the greater your chances of attracting a job. Creation of 100 contact database to facilitate your networking strategy – Will help you be strategic in approaching persons to connect you to opportunities and circulate your resume. Create Skills Inventory – A table of what you have to offer the world and your preferred work context i.e. *This is the most important exercise because it requires you to think critically about what you want and what you have to offer with regard to building your career. The skills inventory will expand your thinking about what jobs to pursue &/or what business to create or partner with, or what additional skills to learn in order to achieve your career goals. State of the Labour Market – What Clues Exist in the Job Advertisement Trends? State of the Labour Market – What Clues Exist in the Financial and other News? How Can Social Media Support My Job Search? Select at Least One Social Media Strategy to Enhance Your Job Search and Learn It and Fully Implement It. Who is In My Corner? What is a Job Club You May Wonder? A Job Club (aka Job Finding Club or Job Support Group) is a strategy to search for jobs using the context of a group or a partner, rather than searching in isolation. It was invented in 1973 by Nathan Azarin (The Career Counselor’s Handbook – Howard Figler & Richard N Bolles). Some experts believe that it has a 70% success rate i.e. Out of 100 job seekers, 70 will find a job based on this method, but 30 will not, if they use a Job Club as their only job search strategy (What Color is your Parachute? 2012 – Richard N. Bolles). Job Clubs may range in size from 2 to 12 persons, and can have a variety of structures and approaches; with the main aim of keeping job seekers strategically motivated, and in-action towards finding jobs. Read more at the link below. If you agree there is strength in numbers, we hope that you will be inspired to form your own job club or join one soon. DOWNLOAD YOUR JOB CLUB GUIDE HERE! Posted by utechalumni in ADVTS, Job Search Tips, JOB VACANCIES. UNAIDS Jamaica Office is seeking to employ a Driver/Clerk on a fixed term basis. The benefits of working from home are plenty: flexibility, more productivity and an easier approach to work-life balance. According to the Telework Research Network, 2.8 million people consider home their primary workplace — and millions more work from home at least one day a week.